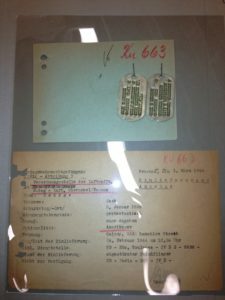 Did you know that to support its mission of preserving history and educating the public about WWII, the World War II History Project offers research, consulting, and digitization services? Over the years, Heather Steele has assisted WWII authors, documentary producers, veterans, families and enthusiasts with a variety of projects related to World War II in English, French, and German. She has translated German documents, assisted in interviewing German veterans, connected former enemies, and provided archival research. She has digitized veterans’ precious photos and records so that they can be passed down to future generations. She also helps new WWII non-profits establish themselves with local, state and IRS officials; conducts funding research for them; and writes proposals for funding. Moving picture files, including captured Axis newsreels, some American gun-cam footage, etc. the BBC Archives in Reading, etc. Local city files including: address books and registrations, Gestapo records (if they exist), local institutions during the war (for example Hitler Youth Glider aerodromes, etc. ), leave records, etc. And much more depending upon your requirements…. Our Executive Director, Heather Steele, also provides translation of German military records into English, and is available to develop and lead customized battlefield tours throughout Germany and other parts of Europe. 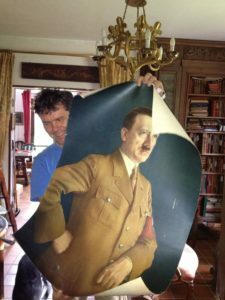 Email us at info at ww2historyproject.org to find out more how we can help you solve your World War II-related mysteries. There is much work to be done in transcribing and translating the interviews we’ve accumulated, and we couldn’t do it without an battalion of volunteers and student interns which becomes a veritable army over the summer. First of all, I’d like to thank all our interns for their tremendous investments of time, energy, and love into helping us preserve these stories for all time. Secondly, I’d like to acknowledge them for the outstanding work they’ve done behind the scenes and for your reading pleasure. We have many more volunteers who transcribe and translate behind the scenes on an ongoing basis, and as an all-volunteer organization, we rely tremendously upon them. If you’d like to be one of them, please don’t hesitate to contact us at info at ww2historyproject.org. 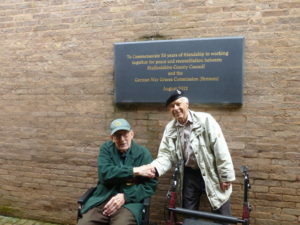 Thanks to so many of our generous donors, we were able to bring C harley and Graham back together in England at the end of May at both Cannock Chase German Military Cemetery and Armougeddon Tank Museum in Leicestershire, England. 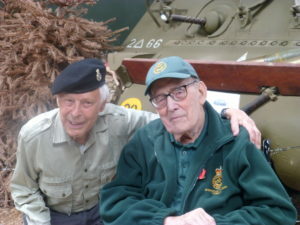 Although Graham did not feel well enough to accompany us on our further travels to Normandy, Charley and I were warmly welcomed attended the Sherwood Ranger’s Tank Regiment’s ceremonies at Gold Beach on June 6, and the Bayeux Museum de la Bataille de Normandie on June 7. Unfortunately, no other WWII veterans were in attendance. Please stay tuned for the mini-documentary, which we’ll start putting together soon. To 5/1/18: Our crowdfunding campaign has brought in $3,500 through our IndieGoGo site (now closed) and direct PayPal donations. A very warm thank you to all our donors, especially World of Tanks player Sofilein, who brought in $1,300!! And the Sherwood Rangers, who donated an additional $300. And although this is not enough to pay for a videographer to accompany us to England and France, it is enough to bring Charley and Graham together again in England, and with a LIBOR grant (1,450 pounds) from the British government, on to France. In total we have accumulated: $5,624.